Cancer patients and the elderly were caught up in the shutdown of vital hospital and community services as nurses again took to the picket line. Several cancer surgeries had to be cancelled, causing serious anxiety to patients who had been booked in to have tumours removed. Some other patients who were due to have scans to diagnose cancer saw them put on hold. The walkout by more than 35,000 nurses, and reliance on emergency cover in most areas of the health service, hit 40,000 patients and people reliant on community services. Some hospital clinics resembled a “ghost town”, said one doctor. Only urgent surgery went ahead and all outpatient clinics for 13,000 patients were cancelled. Many patients are unlikely to have their appointment rescheduled for weeks or months with growing concern at the cumulative effect of the backlog. Another round of patients who were due to attend hospital tomorrow were told yesterday not to turn up. 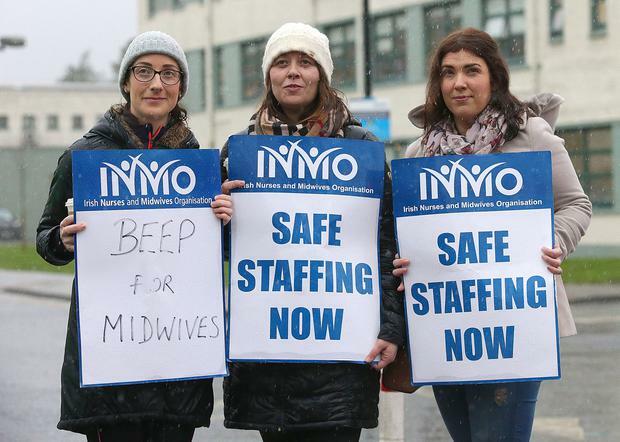 Members of the Irish Nurses and Midwives Organisation are threatening their third day of strike action tomorrow, leaving services struggling to cope. All admissions to respite services in the community have been halted in recent days for the elderly and people with a disability. Day services for people with a disability which are reliant on a service from nurses also shut. Routine public health nurse visits to people in their home were also halted. The HSE said hospitals were yesterday unable to discharge patients to nursing homes. It means that hospital wards are unable to free up wards in many cases. It is becoming increasingly difficult to control the A&E trolley crisis as a result. There were 430 patients waiting for a bed yesterday evening, including 192 who were delayed for more than nine hours. Health Minister Simon Harris, who will appear before the Oireachtas Health Committee today, is due to warn that as the action continues there is increased risk for patients and clients. “We estimate that in excess of 40,000 patients and service users are impacted upon each strike day. Meanwhile, the overtime ban by members of the Psychiatric Nurses Association is causing serious disruption to mental health patients. Some community clinics are having to be shut in order to allow nurses to be transferred to inpatient duties. There is particular concern that the refusal to do overtime overnight will lead to some patients having to have less freedom, and be subjected to more restrictive monitoring due to a shortage of nurses. If the next round of strike action goes ahead tomorrow all outpatient, inpatient and day surgery will again be cancelled. Injury units will be closed, and routine community nursing services along with health centre nurse clinics will be cancelled. Public day centres and day hospitals for older people or people with disabilities will be shut, and all planned respite admissions halted.